The Transportation Security Administration seemed to hit bottom last fall when a congressional investigation revealed misconduct by senior agency officials, a jury trial elicited testimony of on-the-job sexual harassment, and an employee survey ranked the TSA one of the worst federal workplaces. But now as thousands of airport screeners skip work during the government shutdown, the TSA is facing a potential crisis that could hinder air travel for months, damage the struggling agency for years, and threaten aviation security. TSA Administrator David Pekoske said on Twitter Jan. 23 that “security will not be compromised” even as the agency has acknowledged that 7 percent to 10 percent of its roughly 48,000 airport screeners have taken unscheduled absences in recent days, more than double the rate from a year ago. Absences have forced checkpoint closures at some of the world’s busiest airports, including Atlanta’s Hartsfield-Jackson and Houston’s Bush Intercontinental. Screeners missed their second paycheck Friday since the partial government shutdown began Dec. 22. Separately, the Federal Aviation Administration on Friday reported delays in air travel because of “a slight increase in sick leave” at traffic centers in Florida and Washington, D.C. Flights were temporarily restricted into and out of New York’s La Guardia Airport. Nobody knows how many screeners have new jobs and will not return to the TSA when paychecks resume. The TSA is vulnerable to turnover because salaries are so low that many screeners would qualify for federal housing assistance and because 19 percent of screeners work part-time compared to 5 percent of the federal workforce, Office of Personnel Management data show. Many screeners are likely finding new jobs, according to some experts, who warn about staffing shortages and huge security lines. The TSA is fortunate that the shutdown is occurring in January, which is historically the lightest month for air travel. But as the number of airline passengers surges in the spring and peaks in the summer, the TSA might be left with vacancies nationwide. In addition, the steady growth in air travel means that the number of passengers going through checkpoints this summer is certain to be higher than in previous years. Huge security lines materialized across the U.S. in the spring of 2016 when air travel increased as the TSA was cutting its workforce and tightening screening following a government report that undercover agents easily slipped guns and fake bombs through checkpoints. Yet TSA staffing has remained largely unchanged for years as screeners have complained about low pay, difficult working conditions, and poor management. “The TSA has made it so the airline industry can make billions of dollars. But they’re paying the employees who secure the airlines minimum wage basically,” Hydrick Thomas, president of the screeners’ union, said in an interview. In fiscal year 2017, 64 percent of the screeners who left the TSA quit their jobs, OPM data show. Just 35 percent of other federal employees who left that year quit. Even before the shutdown began, the TSA had job openings for screeners at 180 airports, including tiny Manistee, Mich., and major hubs in Dallas, Newark and Charlotte, according to usajobs.gov, the federal government’s employment site. 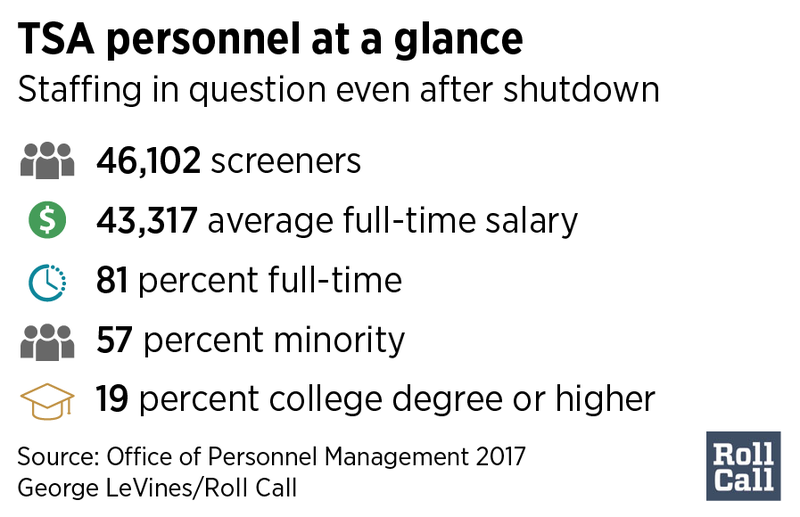 The shutdown is likely to exacerbate the TSA’s struggle to hire and retain screeners at the roughly 420 airports where it operates. Full-time screeners make a starting salary of $32,617 and receive 15 percent to 39 percent more in “locality pay” if they work in a costly area as determined by the government. Under Department of Housing and Urban Development guidelines, a screener living alone and earning the base salary would be “low income” in 3,700 of 5,800 U.S. counties and municipalities and, therefore, eligible for federal housing assistance. Employee surveys have shown for years that salaries are the leading reason screeners quit or transfer to other federal agencies. But dissatisfaction persists. 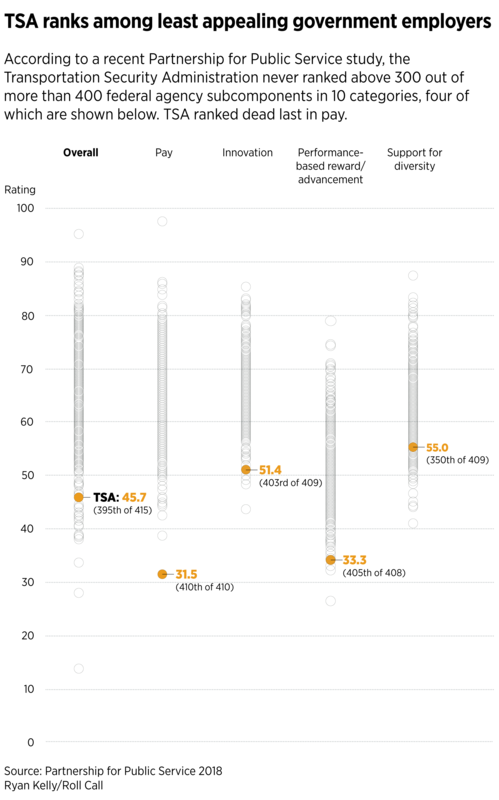 In the latest annual survey of Best Places to Work in the Federal Government, released in December by the nonprofit Partnership for Public Service, the TSA ranked dead last on the question of satisfaction with pay. The TSA’s overall score of 45.7 ranked it 395th out of 415 federal agencies. “The pay definitely has to change,” said Thomas, the union leader, who is president of Council 100 of the American Federation of Government Employees. The union has pushed for years to have screeners moved from their own personnel system to the system that covers most federal employees, which would increase salaries and job protections. But the TSA has been different since it was created two months after the 9/11 attacks to take over airport security from airlines. Congress gave the TSA administrator wide authority to set salaries and make personnel moves under the law that created the agency. “We anticipated that there would be reasons to provide the administrator the authority to move people around,” said James Loy, who ran the TSA in 2002 and 2003. Screener salaries were set at a level that was above what airlines had been paying screeners but that also was acceptable to Congress and the administration, Loy added. TSA administrators have not made a priority of increasing screener salaries as they focused on improving technology. “You have this [personnel] system where you’re not required to raise the pay, and there are always other things that need resources,” said a Democratic House staffer, who asked for anonymity because he was not authorized to speak publicly. The TSA’s problems go beyond money. The agency’s management has contributed to poor morale, investigations and employee surveys have found. Some senior TSA officials have abused their power, taking extraordinary steps such as transferring employees to jobs at airports thousands of miles away. “The toxic combination of unchecked misconduct by senior officials and retaliation against rank-and-file whistleblowers undermined employee morale, reflected in the agency’s astronomical attrition rates,” the House Oversight and Reform Committee found in an investigative report released in September. Mark Hatfield, a former TSA deputy administrator, told the committee that the structure that gave the agency its flexibility “led to toxicity rather than a healthy agency.” In May, the TSA agreed to pay $1 million to three whistleblowers who were transferred from Hawaii to airports in California and Washington state. Pekoske, the administrator, has vowed improvements. But Price, the security expert, thinks the government shutdown might drive airports to hire contractors for checkpoint security, which federal law allows. “There could be legislation to protect the screening process by going to contract screeners or a push by airports to hire contractors just so they’re not in this situation again,” Price said.